Prize winners and their prize winners. We love getting feedback from you guys! 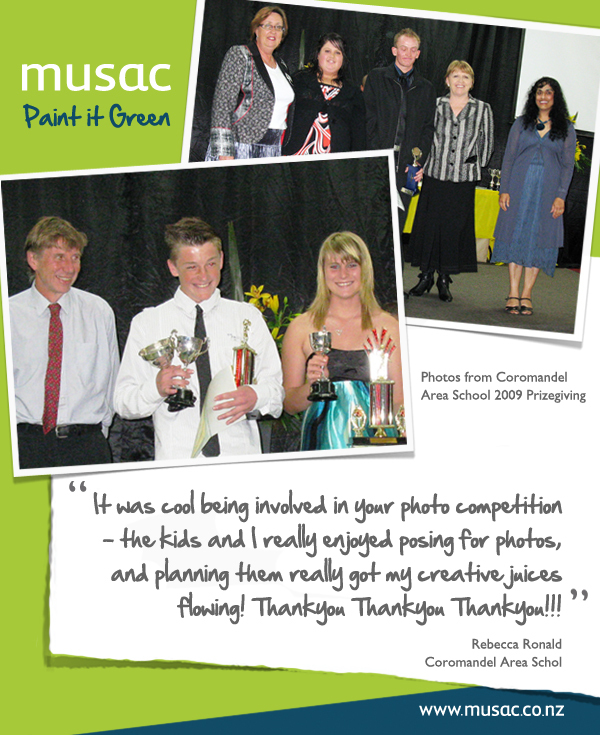 We had this little gem sent through to us from Coromandel Area School, one of the winners from out 'Paint it Green' competition. The prize money was awarded to top students in their chosen subjects. Top photo: Coromandel Lions Club president Lynda Spicer, Head Girl 2009 Aimee Edmonds, Head Boy 2009 Matthew Congdon, Coromandel MP Sandra Goudie, Coromandel Area School Principal Asha Peppiatt. Second Photo: Board of Trustees member Angus Robertson, to sporting students Jordan Olliff and Michelle Attwood.